I am sick and tired of people saying straight off the cuff that they won’t watch this movie as it stars Jim Carrey. Get over it folks! Carrey has proven time and again that he has the acting savvy to pull off a serious’ish role in movies. Take the Majestic for example. So for those of you who are not interested in seeing this great film because of the Mask (which I despised) or Ace Ventura, this is a Jim Carrey who simply won’t disappoint you. This is a thriller with quite a number of clever twists that entangle themselves throughout the film. 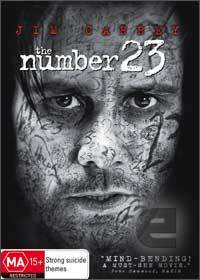 Carrey plays the role of Walter who is given a book from his wife called The Number 23 which seems to totally reflect his life and also give him a glimpse of a possible unpleasant future in store. Everything he has ever known or cared about seems to have the number 23 in it somehow and he is not sure if it’s a blessing or a curse. As he uncovers more and more “evidence”, Walter is certain that he is onto something major. This film is directed by Joel Schumacher and is actually his 23rd project which adds to the mystique of the movie. The way that he handles the camera work is riveting and we are left with something that is magnificent to watch. Audio is also suited to the style of film and at times I found it truly creepy. This is a movie that from the very start to finish I was hooked and I am sure that you will be as well. For those of you wishing to go beyond the movie, there are a swag of extras included which do make for some compelling viewing. Personally I am a fan on extra or bonus material and this filled my need to know more about the movie. Do yourself a favour and check it out, I doubt you will be disappointed.